Keep an eye out for this new invader into our district, as it seems to be moving southward. As you can see from the map below, it is starting to encroach into the north of our Network area and a single infestation was located (and eradicated) south of Inglewood. Buffel Grass (Cenchrus ciliaris and C. pennisetiformis) is a perennial tussock grass from Africa and Asia. 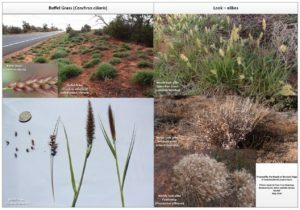 It was introduced as a range-land (semi-arid) improvement pasture grass and is now widespread across northern Australia. It is scattered in the pastoral zones of Southern NSW and South Australia, with it most prevalent in the northern areas but more recently it is found to be extending southwards.